The American Journal of Numismatics, 1866–1920. With many plates, illustrations, maps and tables. Less than a half-dozen complete sets of the Journal remain on hand. Prices on application. The numbers necessary to complete broken sets may in most cases be obtained. An index to the first fifty volumes has been issued as part of Volume LI. It may be purchased separately for $3.00. The American Numismatic Society. Catalogue of the International Exhibition of Contemporary Medals. March, 1910. New and revised edition. New York. 1911. xxxvi, 412 pages, 512 illustrations. $3.00. David Eugene Smith, LL.D. Computing Jetons. 1921. 70 pp. 25 pls. $1.50. Edward T.Newell. The First Seleucid Coinage at Tyre. 1921. 40pp. 8 pls. $1.00. Howland Wood. Gold Dollars of 1858. 1922. 7 pp. 2 pls. 50c. R. B. Whitehead. Pre-Mohammedan Coinage of N. W. India. 1922. 56 pp. 15 pls. $2.00. George F. Hill. Attambelos I of Characene. 1922. 12 pp. 3 pls. $1.00. M. P. Vlasto. Taras Oikistes (A Contribution to Tarentine Numismatics). 1922. 234 pp. 13 pls. $3.50. Agnes Baldwin. Six Roman Bronze Medallions. 1923. 39 pp. 6 pls. $1.50. Howland Wood. Tegucigalpa Coinage of 1823. 1923. 16 pp. 2 pls. 50c. Edward T. Newell. Alexander Hoards—II. Demanhur Hoard. 1923. 162 pp. 8 pls. $2.50. Harrold E. Gillingham. Italian Orders of Chivalry and Medals of Honour. 146 pp. 34 pls. $2.00. Edward T. Newell. Alexander Hoards—III. Andritsaena. 1924. 39 pp. 6 pls. $1.00. C.T. Seltman. A Hoard from Side. 1924. 20 pp. 3 pls. $1.00. R. B. Seager. A Cretan Coin Hoard. 1924. 55 pp. 12 pls. $2.00. Samuel R. Milbank. 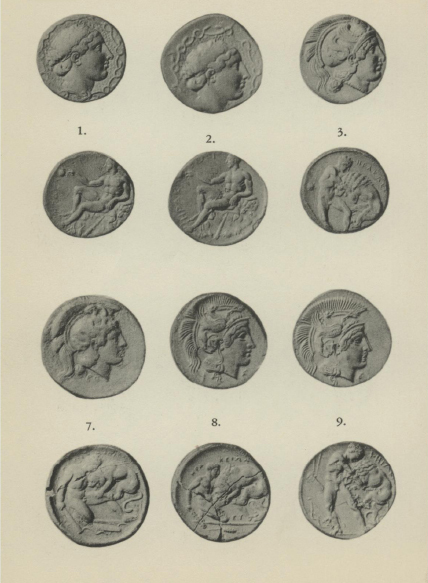 The Coinage of Aegina. 1925. 66 pp. 5 pls. $2.00. Edward T. Newell. 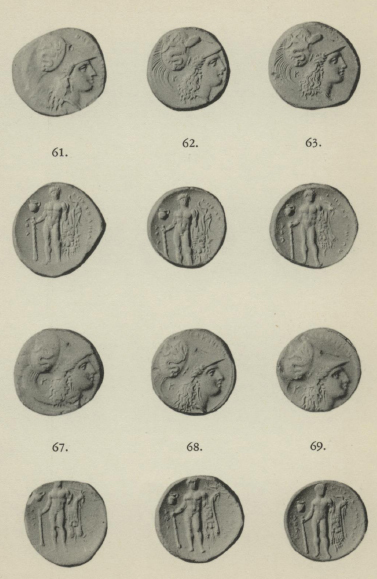 Mithradates of Parthia and Hyspaosines of Characene. 1925. 18 pp. 2 pls. 50c. Sydney P. Noe. The Mende (Kaliandra) Hoard. 1926. 73 pp. 10 pls. $2.00. Agnes Baldwin. Four Medallions from the Arras Hoard. 1926. 36 pp. 4 pls. $1.50. H. Alexander Parsons. The Earliest Coins of Norway. 1926. 41pp. 1 pl. 50c. Edward T. Newell. 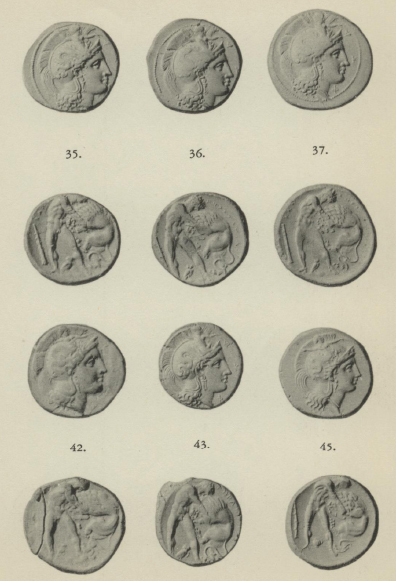 Some Unpublished Coins of Eastern Dynasts. 1926. 21 pp. 2 pls. 50c. Harrold E. Gillingham. Spanish Orders of Chivalry and Decorations of Honour. 1926. 165 pp. 40 pls. $3.00. Sydney P. Noe. 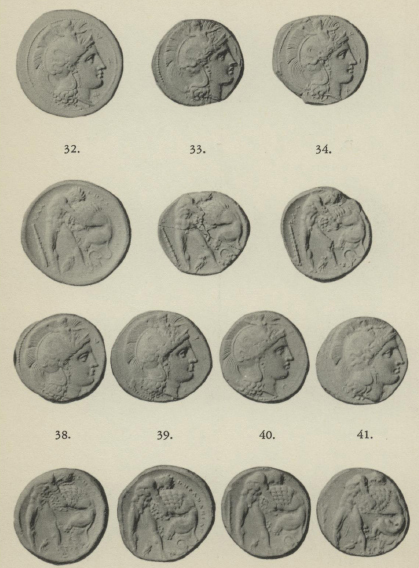 The Coinage of Metapontum. 1927 (Part I). 134 pp. 23 pls. $3.00. Edward T. Newell. Two Recent Egyptian Hoards—Delta and Keneh. 1927. 34 pp. 3 pls. $1.00. Edward Rogers. The Second and Third Seleucid Coinage of Tyre. 1927. 33 pp. 4 pls. $1.50. Alfred R. Bellinger. The Anonymous Byzantine Bronze Coinage. 1928. 27 pp. 4 pls. $1.50. Harrold E. Gillingham. Notes on the Decorations and Medals of the French Colonies and Protectorates. 1928. 62 pp. 31 pls. $2.00. Oscar Ravel. The "Colts" of Ambracia. 1928. 180 pp. 19 pls. $3.00. Howland Wood, The Coinage of the Mexican Revolutionists. 1928. 53 pp. 15 pls. $2.50. Edward T. Newell. Alexander Hoards—IV. Olympia. 1929. 31 pp. 9 pls. $1.50. Allen B. West. Fifth and Fourth Century Gold Coins from the Thracian Coast. 1929. 183 pp. 16 pls. $3.00. Gilbert S. Perez. The Leper Colony Currency of Culion. 1929. 10 pp. 3 pls. 50c. Alfred R. Bellinger. Two Hoards of Attic Bronze Coins. 1930. 14 pp. 4 pls. 50c. D. H. Cox. The Caparelli Hoard. 1930. 14 pp. 2 pls. 50c. Geo. F. Hill. On the Coins of Narbonensis with Iberian Inscriptions. 1930. 39 pp. 6 pls. $1.00. Bauman L.Belden. A Mint in New York. 1930. 40 pp. 4 pls. 50c. Edward T. Newell. The Küchük Köhne Hoard. 1931. 33 pp. 4 pls. $1.00. Sydney P. Noe. 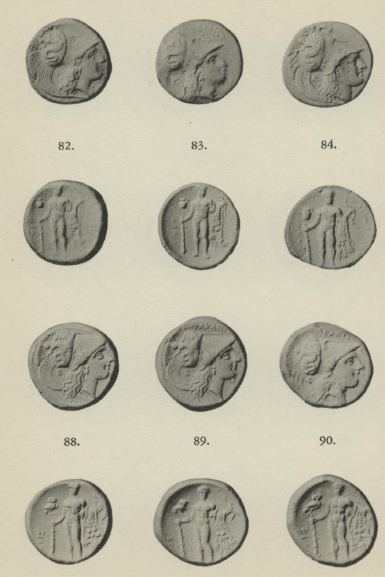 The Coinage of Metapontum. Part II. 1931. 134 pp. 43 pls. $3.00. D. W. Valentine. The United States Half Dimes. 1931. 79 pp. 47 pls. $5.00. Alfred R. Bellinger. Two Roman Hoards from Dura-Europos. 1931. 66 pp. 17 pls. $1.50. Geo. F. Hill. Notes on the Ancient Coinage of Hispania Citerior. 1931. 196 pp. 36 double pls. $4.00. Alan W. Hazelton. The Russian Imperial Orders. 1932. 102 pp. 20 pls. $3.00. O. Ravel. Corinthian Hoards (Corinth and Arta). 1932. 27 pp. 4 pls. $1.00. Jean B. Cammann. The Symbols on Staters of Corinthian Type (A Catalogue). 1932. 130 pp. 14 double pls. $3.00. Shirley H. Weber. An Egyptian Hoard of the Second Century A. D. 1932. 41 pp. 5 pls. $1.50. Alfred R. Bellinger. The Third and Fourth Dura Hoards. 1932. 85 pp. 20 pls. $1.50. Harrold E. Gillingham. South American Decorations and War Medals. 1932. 178 pp. 35 pls. $3.00. Wm. Campbell. Greek and Roman Plated Coins. 1933. 226 pp. 190+ pls. $3.50. E. T. Newell. The Fifth Dura Hoard. 1933. 14 pp. 2 pls. $1.00. D. H. Cox. The Tripolis Hoard. 1933. 61 pp. 8 pls. 2 maps. $1.50. E. T. Newell. Two Hoards from Minturno. 1933. 38 pp. 5 pls. $1.00. Howland Wood. The Gampola Larin Hoard. 1934. 84 pp. 10 double pls. $3.00. J. G. Milne. The Melos Hoard of 1907. 1934. 19 pp. 1 pl. $1.00. A. F. Pradeau. The Mexican Mints of Alamos and Hermosillo. 1934. 73 pp. illus. $1.50. E. T. Newell. A Hoard from Siphnos. 1934. 17 pp. illus. 50c. C. H. V. Sutherland. Romano-British Imitations of Bronze Coins of Claudius I. 1935. 35 pp. 8 double pls. $2.00. Harrold E. Gillingham. Ephemeral Decorations. 1935. 40 pp. 11 pls. $2.00. Sawyer McA. Mosser. A Bibliography of Byzantine Coin Hoards. 1935. 116 pp. $1.50. Edward T. Newell. Five Greek Bronze Coin Hoards. 1935. 67 pp. 9 double pls. $2.00. Alfred R. Bellinger. The Sixth, Seventh and Tenth Dura Hoards. 1935. 75 pp. 5 pls. $1.00. Frederick O. Waage. Greek Bronze Coins from a Well at Megara. 1935. 42 pp. 3 pls. $1.00. Sydney P. Noe. The Thurian Di-Staters. 1935. 68 pp. 11 double pls. $2.00. John Walker. The Coinage of the Second Saffarid Dynasty in Sistan. 1936. 46 pp. 4 double pls. $1.00. Edward T. Newell. The Seleucid Coinage of Tyre. 1936. 34 pp. 5 pls. $1.00. Margaret Crosby and Emily Grace. An Achaean League Hoard. 1936. 44 pp. 4 pls. $1.50. Agnes Baldwin Brett. 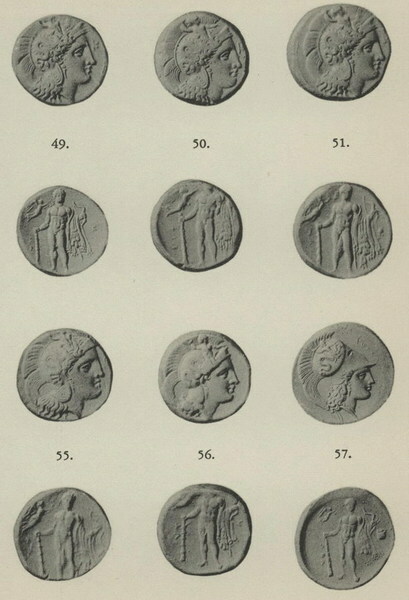 Victory Issues of Syracuse after 413 B.C. 1936. 6 pp. 2 pls. 50c. Edward T. Newell. The Pergamene Mint under Philetaerus. 34 pp. 10 pls. $2.50. Charles C. Torrey. Aramaic Graffiti on Coins of Demanhur. 13 pp. 2 pls. $1.00. Sydney P. Noe. 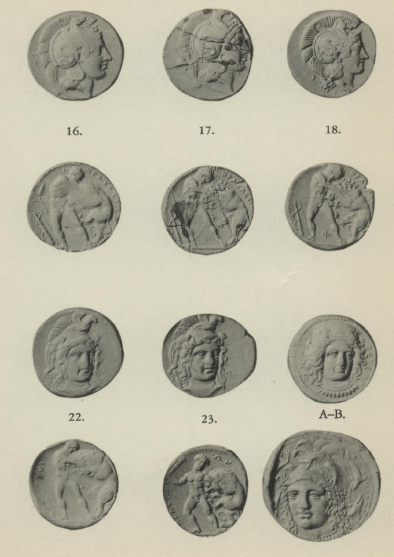 A Bibliography of Greek Coin Hoards. (Second Edition). 1937. 362 pp. $4.00. Naphtali Lewis. A Hoard of Folles from Seitz (Alsace). 1937. 81 pp. 5 pls. $2.00. Harold Mattingly and W. P. D. Stebbing. The Richborough Hoard of 'Radiates.' 1931. 1938. 118 pp. 15 pls. $2.50. Alfred R. Bellinger. 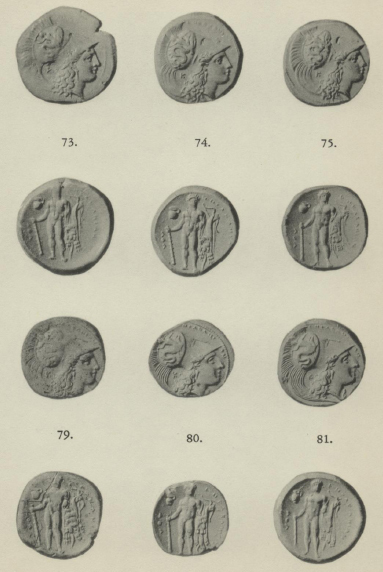 Coins from Jerash, 1928–1934. 1938. 141 pp. 9 pls. $2.50. Edward T. Newell. Miscellanea Numismatica: Cyrene to India. 1938. 101 pp. 6 pls. $2.00. David M. Bullowa. The Commemorative Coinage of the United States 1892–1938. 1938. 192 pp. 10 pls. $2.50. Edward T. Newell. Late Seleucid Mints in Ake-Ptolemais and Damascus. 1939. 107 pp. 17 pls. $2.00. Alfred R. Bellinger. The Eighth and Ninth Dura Hoards. 1939. 92 pp. 13 pls. $2.00. Harrold E. Gillingham. Counterfeiting in Colonial Pennsylvania. 1939. 52 pp. 2 pls. $1.00. George C. Miles. A Byzantine Weight Validated by al-Walid. 1939. 11 pp. 1 pl. 50c. Jaime Gonzalez. A Puerto Rican Counterstamp. 1940. 21 pp. 2 pls. $1.00. Harrold E. Gillingham. Mexican Decorations of Honour. 1940. 53 pp. 17 pls. $2.00. Donald F. Brown. 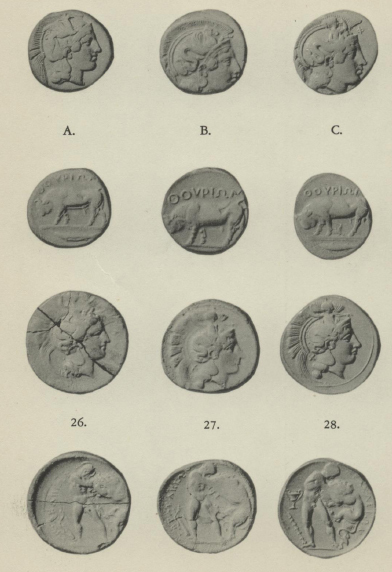 Temples of Rome as Coin Types. 1940. 55 pp. 9 pls. $1.50. the merrymount press, boston, u. s. a. 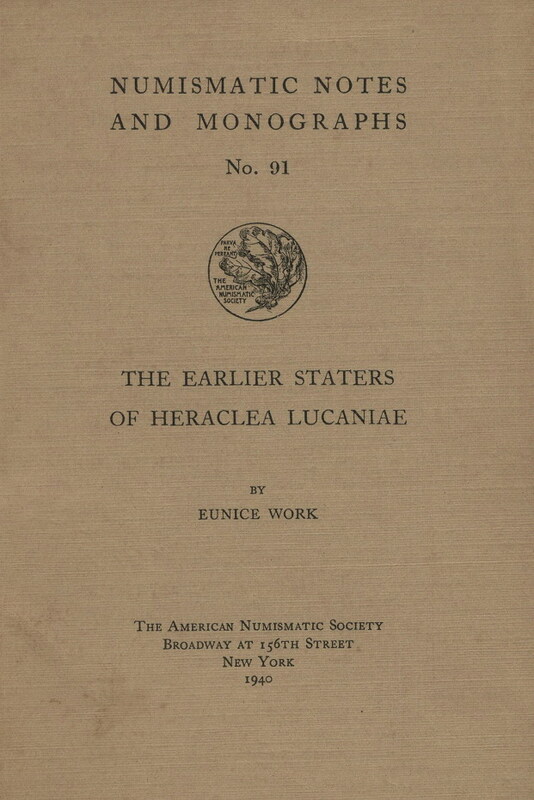 THE purpose of this monograph is to supply the groundwork for an accurate chronology of the staters of Heraclea Lucaniae to circa 300 B.C. 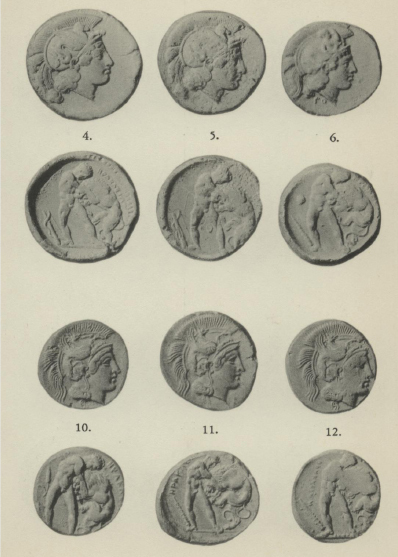 Four kinds of evidence have been weighed: the history of the city, contemporary coins of neighboring cities, hoards, and finally the sequence of dies in the coins of Heraclea itself. Comments on the establishment and history of Heraclea have been gathered from both Greek and Latin writers. Coins of Tarentum, Thurium, Croton, and Metapontum have been studied for corroboration in grouping types and signatures. For the coins of these cities in turn, the exact comparison and grouping of Heraclean dies should be valuable. The usefulness of hoards for the present study is limited by the wide range of their terminal dates, as will be shown by definite example. The burden of proof rests then with the sequence of dies. 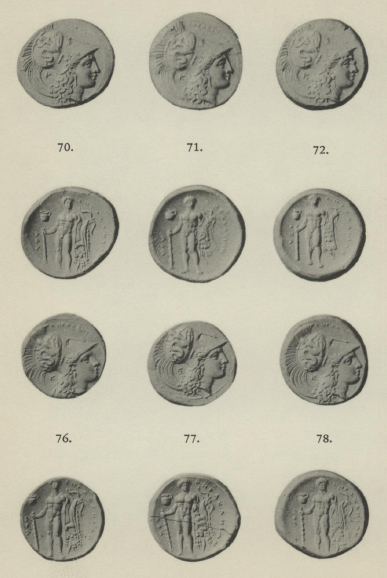 The coins classified in the Historia Numorum under Heraclea II and III, pp. 71–72, staters of full weight, are here represented by ninety-two groups. Each num- ber, 1 to 92, stands for a single combination of dies. The groups are the result of the comparison of three hundred staters from all available sources. The presentation of as many as three hundred coins in a systematic study has been made possible by friendly help and encouragement from every side: Mr. Newell and Mr. Noe in New York, Mr. Robinson at the British Museum, Sir Sydney Cockerell, with the stimulus of interest as well as direct assistance; and Dr. Lloyd, Sir George Macdonald, Dr. Milne, M. Jean Babelon. All these have aided with a kindliness which has fairly justified the task. There has been ready aid from museum officials throughout Europe: in the Museo Nazionale of Naples, the Bibliothèque Royale of Brussels, and in Copenhagen, Vienna, Berlin, and Munich. No one, indeed, who was consulted stopped short of the fullest response. THE mighty Heracles, it seems, was rival to the conqueror Alexander in fastening his name on cities throughout the ancient world. Of the Alexandrias, one has taken precedence and may now be mentioned without distinguishing adjective of mountain, people, or country. But to the name of thirty Heracleas of more and of less renown, it is necessary to add a descriptive phrase of location or history. The Thessalian Heraclea, in Thucydides and Xenophon, is designated by its neighborhood ἡ ἐν Tραχ νι or ἡ Тραχινία. Strabo speaks of the Macedonian town as Λύγκηστις. Heraclea Minoa has added the name of its reputed founder. Asia Minor has its ad Latmum, its ad Sipylum, and Salbace. The South Italian town whose staters are presented here is set apart by the territorial name of Lucania. It is one of the four Heracleas of Roman history and geography mentioned in the pages of Mela, Pliny, Cicero, Livy, Caesar. The geographical index of the Historia Numorum includes these four as well as five others in the list of mint cities of that name. These cities are represented by coins ranging from the years of Phoenician influence in the Sicilian Heraclea, through Spartan colonial enterprise, to the bronze coinage of the Roman Empire in the Heracleas of Macedonia and Asia Minor. In history and in legend the fame of Heraclea Lucaniae is overshadowed by that of its neighbors. Thurium, less than forty miles to the south, numbered among its colonists Herodotus of Halicarnassus, and Lysias, the orator. Croton, the home of Pythagoras and his brotherhood, is credited even now, in a popular manual of music, with the "invention of the science of music, in 530 B.C." The strong man of Greek athletics lived at Croton too, Milo, whose philosophy did not keep pace with his muscles. Metapontum, the city of the golden fields of grain, is said to have seen the death of Pythagoras. Tarentum has been distinguished for its harbor from the time the son of Poseidon came swinging into the roadstead on his dolphin, through Greek, Roman, and Byzantine occupation down to its more recent impressment as a torpedo-boat base. Heraclea has no such claim to renown. One of the classical dictionaries, in fact, sets down the word Heraclea as "a name given to more than forty towns in Europe, Asia, Africa, and the islands of the Mediterranean." So sweeping a dismissal may be countered by two points of interest—Heraclea's onetime headship of the Italiot Greek confederacy, and, of greater concern, the staters of a series of coins deservedly studied and admired. If the coinage of a city follows the periods of its history, as it is reasonable to expect, the logical divisions in the chronology of Heraclea Lucaniae would presuppose variations of type or weight determined by the time of the founding of the colony, by the successive hegemonies of Archytas of Tarentum, Archidamus, Alexander of Epirus, and Cleonymus; by a possible interval of Lucanian jurisdiction; Pyrrhus; and finally, by the post-Pyrrhic Roman protectorate. The surrender of the city to Hannibal in 214 B.C. takes it beyond the range of the present study. 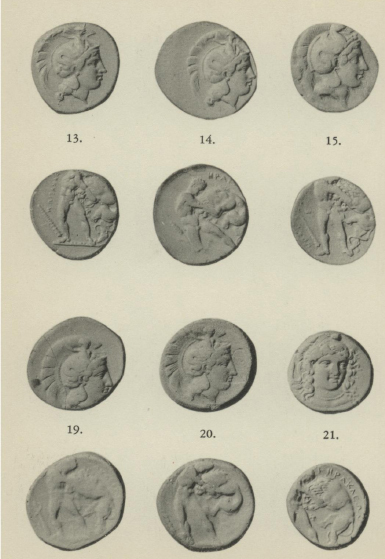 The staters of Heraclea, like the periods of its history, fall into a neat set of groupings, but added to the impossibility of finding a correspondence between coin types and hegemonies, there is the difficulty of fixing the various groups in an unassailable order. It is true that the technical evidence of the coins can be incontrovertible within an interlocking series of dies, obverse and reverse, but there will be inevitable breaks in the sequence when there are no linking coins at hand. When a linking coin can be found, it must be examined with wary skepticism until there is no doubt of authenticity and no danger of mistaking a flaw for a die worn by long use. Existing classifications of the staters of Heraclea are based upon style, and upon historical and economic evidence, upon the evidence of hoards and of contemporary coinages of neighboring cities. To these indications of chronology we shall now add the data of an exact comparison of the dies of all available staters. The scheme is to follow the sequence of dies, to trace by microscopic study a single die from the time it first appears in its sharp and perfect outlines, until, as one coin after another is struck from it, the blows of the hammer produce a tiny break. A faint crack is sometimes mended, furnishing its own kind of clue. Sometimes, unchecked, the break widens almost imperceptibly through the striking of as many as five or six coins before the die must be discarded. It is assumed that the reverse die first gives way, subject to the direct blows of the hammer. When it is replaced it is thus joined with the obverse of the previous combination. The obverse itself then breaks before the new reverse is out of use; and as a series of coins is followed from one group to the next, an almost rhythmical pattern can be traced. The dearth of evidence for a certain correlation of history and coinage for the town of Heraclea does not leave us entirely without resource. There are two possibilities, each believed to be profitable in itself. When they are taken in conjunction they will at least furnish a solid foundation, to which future evidence may be added. The first is to marshal the elements of the history of Heraclea which are scattered through the somewhat intractable observations of contemporary and later chroniclers. The second is to establish groups of coins in which an evolution is shown through the combination of a common obverse die with two or more reverses, or a common reverse die with two or more obverses, with the hope that the final connecting links between the groups may be found eventually in undiscovered hoards or in collections hitherto unavailable for study. The method of exact comparison of dies has the advantage of discouraging arid and unscientific speculation about doubtful symbols and letters. The criterion of style within such short time limits is hardly to be trusted. On the other hand, it does not mean that imagination is to be entirely barred. Art is involved, as well as economics, and there will be no apology for borrowings from the artists' judgments. The history of Heraclea as it appears in the annals of Italy whether Greek or Roman, is that of a city away from the march of major events. Heraclea was founded in 433–432 B.C. Diodorus (XII 36) sets down the data of that somewhat prosaic year. At Athens, one Apseudes was archon. The Roman consuls were T. Menenius and Proclus Geganius Macerinus. Spartacus, king of Bosporus, died after a reign of seventeen years. Seleucus succeeded him and was king for four years. There follows an account of Meton and his calendar, with several lines of detail and comment. The brief chapter closes with this unannotated remark: "And in Italy the Tarentines removed from their native place the people who were living in the town of Siris and, adding townsmen of their own, they established the city which was named Heraclea." Strabo (VI 264) explains the founding of Heraclea as a compromise between the Thurians, under the Spartan Cleandridas, and the Taren tines. These warring factions "peopled Siris jointly, although it was considered the colony of the Taren tines; later it was called Heraclea, with change of site as well as of name." Strabo is here relying, he says, upon the word of Antiochus. Siris itself, according to Strabo (VI 280), was thought to have been a Trojan city, since it possessed a wooden image of the Trojan Athene. The canny Strabo thought it no more remarkable that the image should be reputed to open and close its eyes than that the image of the Trojan Athene, brought straight from Troy, should appear in more Italian towns than one. Strabo mentions incidentally the counter-tradition that Siris as well as Sybaris was of Rhodian origin. The site of Siris, he tells us, was about two and a half miles from Heraclea, and about thirty-three from Thurii. The twenty-four stadia from Heraclea to Siris is attested by Appian too. The Elder Pliny (N. H. III 197) speaks of Heraclea's position inter Sirim et Acirim, and adds that it is sometimes called Siris. Livy (VIII 24) suggests no doubt as to name or origin when he records the conquest of Alexander of Epirus, who took the city of "Heraclea, a Tarentine colony, from the Lucanians." According to this meager account of the beginnings of Heraclea as a colony, the coinage might be expected to show something of the nature of each of the component parts: an Athenian element from Thurium and from Tarentum a Dorian touch, along with the inevitable economic influence of so powerful a city. 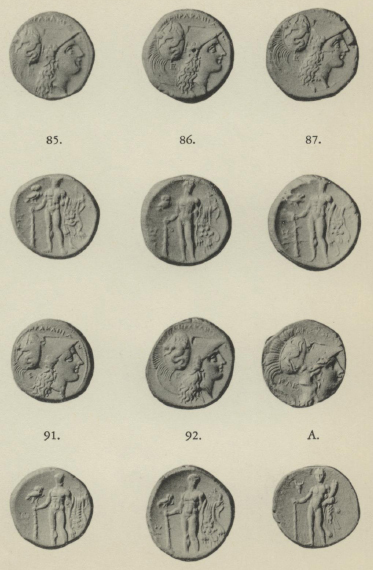 Thus Head (Historia Numorum p. 73) speaks of the coin types of Heraclea as reflecting its double origin: "the head of Athena is borrowed from Thurium and the cultus of Herakles, who gave his name to the city, from the Dorian Tarentum." This statement is almost literally justified in the close resemblance of the Thurian coin to No. 6 of the Berlin staters of Heraclea (cf. PI. III). For fifty years after the establishment of Heraclea its history proceeds without chronicled event. The Peloponnesian war had begun and ended. In the narrative of the campaigns and allegiances of the western field of war the name of Heraclea is not mentioned, though the accounts of the moves of Thurium and Tarentum are not to be read without regard to Heraclea. The year 380 B.C., when Archytas took command at Tarentum, is unanimously set as the termination of the first era of the Heraclean mint. It is the only one of three or four eras on which authority is not divided. Even that attempt at definition is hard to substantiate by the coinage itself. The fullest single account of the generalship of Archytas is found in Diogenes Laertius , VIII, 79–83. We are told that he held command in the city for seven terms of office in spite of a law to prohibit even a second year. It is said that Archytas himself was undefeated in battle, though his army was on one occasion captured immediately when some variance led Archytas to resign the leadership. Diogenes Laertius follows these observations with matters of literary and scientific interest. Archytas, however, appears once more in his pages with the assumption of influence. In the sketch of Plato (Diog. Laert. III, 22), the biographer quotes a letter from Archytas to the younger Dionysius asking pardon for Plato, whom the tyrant had accused of conspiring for the liberation of Sicily. The lexicographer Suidas adds little to our information. His brief paragraph makes every word count: 'Аρχύτας Tαρευτ υος το οιυο δέ τ ν 'Ιταλιωτ ν προέστη, στρατηγὸς αἱρε εὶς αὐτοκράτωρ ὑπὸ τ ν πολιτ ν καὶ τ ν περὶ ἐκε νον τὸν τόπον 'Ελλήνων "Archytas, a Tarentine, in command of the Italiot federation, elected, absolute in power, chosen by the Greeks of all the neighborhood as well as by the citizens of Tarentum." Strabo (VI 4) refers to the command of Archytas as being "for a long time." His further description (VI 280) of the fortunes and character of Tarentum takes her to task for the feeble policy of using foreign generals. These he enumerates, and continues with an instance of the inevitable friction between alien commanders and their employers. The people of that part of Magna Graecia had been holding their usual assembly at Heraclea under Tarentine authority, but now a quarrel with the general of the moment, Alexander of Molossus, led to his attempt to change to Thurian territory the place of meeting. The resulting complications are said to have been responsible for Alexander's death. Of the other generals those who immediately preceded and followed Alexander were of Sparta. A fourth was Agathocles of Syracuse, and the last, in the war with Rome, Pyrrhus of Epirus. 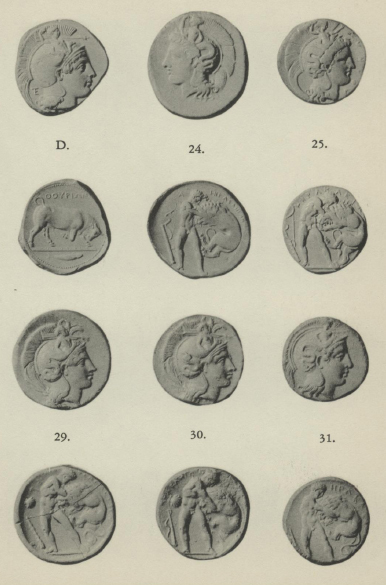 In none of the records do we find more than a conjectural basis for numismatic chronology. 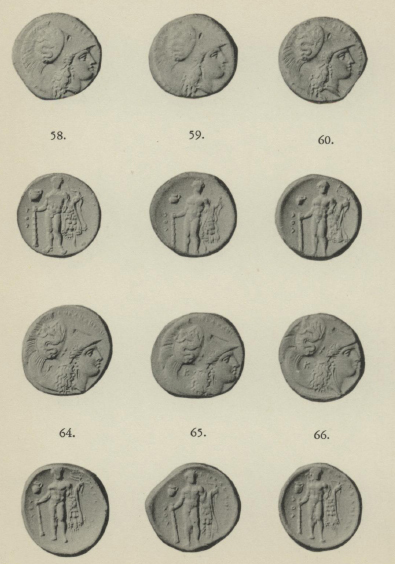 The coins themselves must be expected to bear the brunt of the decision as they stand in series on the plates and accompanied as they are by exact tabulations of the specimens not pictured. The coin that takes first position in the chronology of the staters of Heraclea has kept its place unquestioned in numismatic commentaries. The fifteen examples of this type are found in a dozen different collections, illustrating the geographic range of succeeding groups as well: London, Cambridge, Paris, New York, Berlin, Geneva, Naples, The Hague. There is none in Vienna, none in Brussels or Munich, in Copenhagen or Oxford. The fifteen coins show a single obverse die, the head of Athena adorned with a wreath of olive, against the background of the aegis with its border of intertwining serpents. Three coins, and a possible fourth, change the reverse die, not in type but in proportion of both design and letters. The Heracles of this die is half-reclining on a seat over which the lion-skin has been flung. He holds a one-handled cup in the outstretched right hand; at his left hand leans the club, with a sea-shell at its side. No. 3, an isolated pair of coins, one in Paris and one in New York, is given its place on grounds of style alone. Athena has put on her helmet now and will wear it to the end of the series, with one sharp change of kind, when the round Athenian headgear gives place to the Corinthian's long straight visor (No. 57, Pl. V). The changing adornment of the helmet, sea-horse or Scylla, cannot be so strictly defined. There is no point at which one can say with certainty that here the griffin or sea-horse type ends and the Scylla begins. On this second type, the sea-horse of the helmet has a blunt, curled wing reminiscent of the early Corinthian colts. Heracles on the reverse stands at grips with the lion. In the next group (Nos. 4–5), the types are the same, but the sea-horse straightens his wings and Heracles changes his stance. These first groups are set in juxtaposition by the symbol of the cockle-shell. It is true that such a placing puts a Scylla type unexpectedly early, but actual mulings of later groups show a like interchange, careful as we must be about judgments based on muling. As the series proceeds the later groups too are held in tenuous bond by symbols: wheat-heads, bows and quivers, and clubs; still later they are fixed in place by the inscriptions of magistrate or artist, as numismatic tradition has distinguished such signatures. In some cases there are parallel "signatures" in the coinage of neighboring cities, Metapontum, Thurium, or Tarentum, to lend greater weight to a classification. All such coincidences of signatures may have significance, but in the present state of our knowledge we are still unable to declare unequivocally what that significance is. Changes in style and pattern are marked, yet not indicative beyond controversy, of place in the series. A type in which the wings of the griffin curl again, but keep their points (Nos. 8–12) is represented by nineteen coins apparently struck from a single obverse die. With this die five reverse dies are combined, and two of those are combined in turn with a single obverse of the Scylla type. It is at this point that we begin to find single letters and inscriptions, a sigma at the side of Heracles (No. 15), a Φ between his feet (Nos. 17–19), an A above his bow and club (No. 24), or at Athena's neck (Nos. 19–20). Now appears the astonishing and delightful Aristoxenus signature, in microscopic letters at the base of the helmet's crest (Nos. 19–20). The name is repeated in part on the exergual line of the reverse, АΡΙΣΤΟΞΕ (No. 20). Before we take final leave of the sea-horse type there comes a facing head of Athena, with at least two different obverse and three reverse dies (Nos. 21–23). Of the reverse types one fairly poses Heracles for the photographer, though the lion seems no less fierce in his attack on this round-headed youngster swinging an Indian club. With the next coin (No. 24), the Scylla type is established, to follow through to the end of the series. This strange creature hurls a stone (Nos. 25–26 and from 32 onward), or shoulders an oar or rudder (Nos. 13–14, 19–20, 27–30), or holds a short staff (No. 31). But just before the helmet transition, made once and for all (No. 57), there comes a decided change in the type of the reverse (No. 49). Heracles has conquered the lion and with the struggle over, stands holding the pelt on his arm—a pelt with a score of variations of draping, and differences of paws and nose and tail. 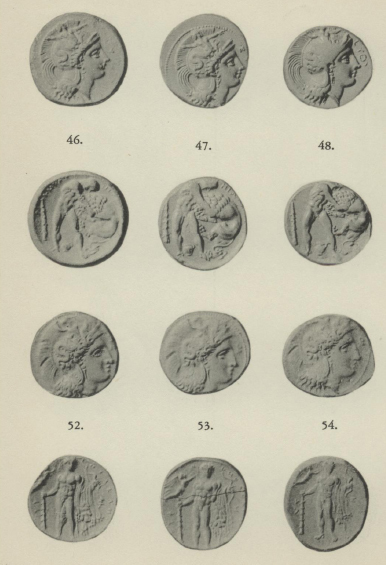 The triumphant Heracles appears first on several coins having obverses with the Athenian helmet type (Nos. 49–56). At his left, flies Nike with a crown of victory. The first coin of the Corinthian helmet pattern is so placed because of a similar Nike, as well as the same inscription, АΘА, beside the club of Heracles. At the right stands a cup as symbol, and when the Nike disappears the cup continues for as many as twenty-six types with slightly varying dies. A reduced-weight stater rounds out Plate VIII. The landmark of reduction of standard, from a stater of seven and a half grams to one of six and a half, or less, coincides with that of the surrounding cities. Head dates this reduction c. 281 B.C. The style shows no sharp demarcation of workmanship. Heracles has long since slain the lion of his earlier struggles and is standing in a more and more self-conscious pose. Symbols and letters are multiplied, and artistry is lost in apparent carelessness. A long and careful contemplation of the staters of Heraclea has served to put them in groups as exact as the present-known coins permit, coins assembled from the chief collections of Europe and America. These groups will doubtless change position with the further findings of Archaeology and the addition of fresh combinations of dies. The task that remains for the future is to correlate the history and the coin-sequences of Heraclea with those of neighboring, allied, South Italian towns, and to apply to this broader field the corroboration of hoards. It seems logical, in fact, to look to a monograph which would be devoted to those questions alone. In the coin designated as Heraclea 6, for example, there is an obvious parallel to the Thurium coin bearing a so-called scanning Scylla (cf. Pl. III). The incuse coin of Metapontum which was overstruck and appears here as Heraclea 4a should be taken into account. The facing head of the Croton staters (cf. Pl. III) might be put to good use in solving the perplexity of the like type at Heraclea. Expectation must be tempered on the other hand by the result of comparing studies even now available. Mr. Noe's "Thurian Di-staters" should have been more helpful, but the Scylla type which appears on the di-staters shows only slight analogy to the Heraclean staters. With Tarentum and with Croton too, the results are negative, for reasons different but equally valid. A similar result was seen in the use of Breglia's careful publication, Due Tesoretti di Monete Greche della Magna Grecia, Napoli, 1939. The first of these hoards contains five staters of Heraclea, three of them easily identified, but so far as our purpose is concerned, the evidence is negligible. The arrangement of coins in the scheme which follows is based upon a minute comparison of dies and the linking of groups by means of a common die occurring in two or more groups. For the sake of clear and simple reference, each type is given a consecutive Arabic number. 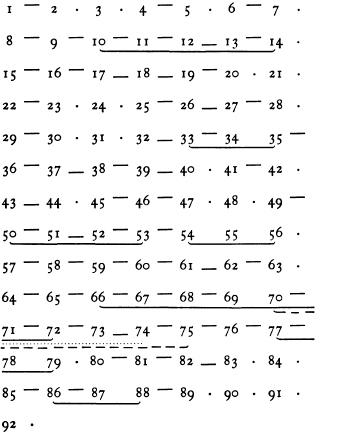 Each of these numbers then represents a pair of dies. When one of the two dies changes, the numerical designation is changed. Under each number there stands a list of coins struck from that pair of dies. These coins are designated by letters of the alphabet, and a representative one, the first on the list, illustrated. Thus the notation I:a–k means that there are eleven coins from one pair of dies, while 2 d indicates the fourth coin of the second combination of dies. A glance at the brief description will then show that the obverse die of 1 and 2 is the same. This procedure does not vary throughout the tabulation. In the enumeration of coins the designation of the collection or catalogue is deliberately brief. Besides the coins in the British Museum Catalogue, there are in the British Museum later unnumbered acquisitions. In Cambridge the Fitzwilliam Museum has, besides the McClean Bequest, several staters under the names of the Young Bequest, the De Pass, and the Leake collections. Corpus Christi College holds the Lewes collection. Dr. Lloyd's fine collection too was examined at his home in Cambridge. The separate collections in the Museo Nazionale in Naples appear as (1) Naples 2202–2226, the coins which appear in the Catalogo del Museo Nazionale di Napoli, and (2) Santangelo 3452–3503, the pieces in the Fiorelli catalogue of December 4, 1866. In Paris the coins in the Bibliothèque Nationale are referred to as (1) Paris; (2) Rothschild; (3) Luynes (the collection of the Duc de Luynes). The Bibliothèque Royale in Brussels furnished five examples, designated as Brussels; and it was there that the four staters of The Hague were first mentioned. Glasgow is responsible for the Hunter collection. No attempt has been made to include coins from collections or catalogues which could not supply either casts or accurate photographs. The numbers of the Berlin pieces do not in every case agree with the Beschreibung numbers, since the descriptions unverified by photographs do not permit exact identification. 1. Obv. Head of Athena, r., adorned with wreath of olive; hair bound in a knot with upturned ends; background, aegis with intertwined serpents. Rev. ΗΡАΚΛΕΙΩΝ. Heracles, naked, half-reclining on seat covered with lion's skin, holding a small one-handled jug in outstretched right hand; at his left hand, club; beneath it, a shell. 2. Obv. Same die as above. Rev. Type as for No. 1. Club at different angle. 3. Obv. Head of Athena r., wearing crested Athenian helmet adorned with sea-horse with rounded, curling wing. Rev. ΗΡАΚΛΕΙ—. Heracles struggling with lion; in l. field, club and shell. 4. Obv. Similar to No. 3. Sea-horse with straight, pointed wing. Rev. ΗΡАΚΛΕΙΩΝ. Similar, but with bow and club at left. 5. Obv. Die of No. 4. Rev. Similar to No. 4. 6. Obv. Head of Athena to r. ΓО below neck. Helmet adorned with a Scylla, left arm bent to her head, the right at side. Rev. ΗΡАΚΛΕΩΝ. Club and shell at left. 7. Obv. Die of No. 6. Rev. Inscription almost indistinguishable.† Heracles, holding club in r. hand and half-kneeling, grapples with the lion. In exergue, quiver and bow. 8. Obv. Σ beneath chin. Helmet adorned with griffin having curling, pointed wing. Athena's hair without knot as heretofore. Rev. ΗΡАΚΕΙΩΝ. Εϒ above exergue. Heracles, kneeling, with club in r. hand, grapples with the lion. Ear of grain in exergue. 9. Obv. Die of No. 8. Rev. ΗΡАΚΛΙΩΝ. Heracles, standing, grapples with the lion. At left, quiver; beneath it, the club and bow intertwined. 10. Obv. Die of Nos. 8–9. Rev. ΗΡАΚΛΕ—. Similar to No. 9. At left, ear of grain and club. 11. Obv. Die of Nos. 8–10. Rev. ΗΡАΚΛΕΙΩΝ. Similar to Nos. 9–10 in type. At left, club. 12. Obv. Die of Nos. 8–11. Rev. Retrograde inscription, ΗΡАΚΛΕΙΩΝ in l. field. On exergual line, ΕϒΦΡО. * At left, club. 13. Obv. Head of Athena, r., wearing crested helmet adorned with a Scylla whose right arm is upraised and the left balancing a rudder over her shoulder. Rev. Die of No. 12. 14. Obv. Die of No. 13. Rev. Die of No. 10. 15. Obv. Similar to No. 3. Helmet adorned with sea-horse with rounded, curling wing. Rev. ΗΡАΚΛΕΙΩΝ. In field to l., club and W (Σ sidewise). 16. Obv. Die of No. 15. Rev. ΗΡАΚΛΕΙΩΝ. In field to l., club and bow, and ear of grain with stem and leaf. 17. Obv. This die is possibly a recutting of the obverse die of Nos. 15 and 16. Rev. ΗΡАΚΛΕΙΩΝ. In field to l., club and bow; between feet, above exergual line, Φ. 18. Obv. Helmet adorned with sea-horse with pointed, slightly-curling wing. In field behind, . Rev. Die of No. 17. 19. Obv. Helmet adorned with Scylla with upraised arm. In minute letters along the base-line of the crest, АΡІƩТΟΞΕ[ΝΟƩ]. At back of neck, A.
Rev. Die of Nos. 17 and 18. 20. Obv. Die of No. 19. Rev. НΡА ΚАΕΙΩΝ. On exergual line, АΡІΣΤΟΞΕ. 21. Obv. Head of Athena, three-quarters facing, wearing crested helmet and necklace of beads. Rev. ΗΡАΚΛΕΩΝ. In field to l., club and bow. 22. Obv. Same type as No. 21. 23. Obv. Die of No. 22. 24. Obv. Head of Athena, facing l., wearing helmet adorned with Scylla, her right hand raised to forehead, the left, akimbo. Rev. ΗΡАΚΛΗΙΩΝ. Similar to No. 22. At left, A. In l. field, bow; beneath it, club. 25. Obv. АΘАΝАΣ. Head of Pallas, r., helmet adorned with Scylla holding rock (?) in upraised r. hand. Rev. ΗΡАΚΛΕΙΩΝ. In l. field, bow; beneath it, and touching, club. 26. Obv. Die of No. 25. Rev. ΗΡАΚΛΗΙΩΝ. Club and bow in l. field. 27. Obv. No inscription. Behind neck, X. Hair bound in a knot beneath neckpiece of helmet—cf. types of Nos. 3–7. Scylla holds rudder as on Nos. 13–14. Border of dots. Rev. Die of No. 26. 28. Obv. Die of No. 27. Rev. ΗΡАΚΛΕΙΩΝ. In l. field, two-handled cup; beneath it, club. 29. Obv. The figure of Scylla is stocky and rather masculine in character. Her l. hand projects prominently above the peak of the helmet. The cast gives the effect of a crescent behind her head. Rev. ΗΡАΚΛΕΙΩΝ. At l., E P (retrograde), shell; beneath it, club. 30. Obv. Die of No. 29. Rev. ΗΡАΚΛΗΙΩΝ. In l. field, shell; beneath it, club and bow. 31. Obv. The Scylla on the helmet holds the left arm outstretched, the right, akimbo. The right hand holds a short staff. Rev. ΗΡАΚΛ.... Heracles, standing, grapples with the lion. In field, club. 32. Obv. Athena with unbound curling hair and wearing a slender earring. Scylla, with both arms outstretched, is apparently hurling a rock. Border of dots. * In front of head, Δ Κ Φ.
Rev. ΗΡАΚΛΗΙΩΝ. ΚАΛ. Above ex-ergual line between the feet of Heracles, owl. 33. Obv. Similar to No. 32. Triple-pendant earring. Rev. Die of No. 32. 34. Obv. Die of No. 33. Rev. Same type as Nos. 32–33. 35. Obv. Same type as Nos. 32–34. Rev. Die of Nos. 32 and 33. 36. Obv. Die of No. 35. Rev. Similar to No. 33. 37. Obv. Die of Nos. 35–36. 38. Obv. Similar to Nos. 35–37. Rev. Die of No. 37. 39. Obv. Die of No 38. Rev. Similar to No. 38. 40. Obv. Same type as No. 39, and with same (?) letters. The flap of the helmet is decorated with a palmette. Rev. Die of No. 39. 41. Obv. Die of No. 40. Rev. Same type as No. 40. 42. Obv. Die of No. 41. Rev. Same type as No. 41. 43. Obv. Same type. The design of the earring is peculiar to this coin, three uniform pendants in even alignment. Rev. Similar to No. 42. 44. Obv. Similar to No. 43. Rev. Die of No. 43. 45. Obv. The head of Pallas is of smaller proportions. In r. field, Εϒ. Rev. The owl between the feet of Heracles is here replaced by a one-handled, fluted jug. 46. Obv. Die of No. 45. Rev. ΗΡАΚΛΗΙΩΝ. Similar to No. 45. 47. Obv. Die of Nos. 45–46. Rev. Similar to No. 45. 48. Obv. Similar to No. 45. Inscription on r., ΕϒΘϒ. 49. Obv. Similar type. A palmette adorns neckpiece of helmet. In front of forehead, K.
Rev. The ethnic, to r., is off-flan except on d, where it is illegible. Heracles, standing, holds lion's pelt over left arm; in his 1. hand, a bow. The right hand grasps club. At 1., Nike, flying r., extends crown. In 1. field, АΛ; in r. field, Σ. This type, save for changes in accompanying symbol and inscription, continues in use unchanged for the full-weight issues. 50. Obv. Die of No. 49. Rev. ΗΡАΚΛ[ΗΙΩΝ] on r. ΕϒΦ to 1. of club, and reading upward. 51. Obv. Die of Nos. 49 and 50. Rev. Similar to No. 49—Nike larger in scale. Inscription, ΗΡАΚΛΗΙΩΝ. Cf. 52a. 52. Obv. Similar to No. 49—probably same die in worn condition. Rev. Die of No. 51. 53. Obv. Die of No. 52—note earring elongated by die-break. Rev. Die of No. 50. 54. Obv. Die of Nos. 52–53. Rev. Similar to No. 49. 55. Obv. Similar to No. 49. 56. Obv. No inscription. The head of Athena is of smaller proportions; and the neckpiece of the helmet without adornment. Rev. Die of No. 54. 57. Obv. ΗΡАΚΛΗΙΩΝ. Head of Athena with Corinthian helmet adorned with a Scylla, markedly reduced in scale. Rev. ΗΡАΚΛΗΙΩΝ to r. АΘА to 1. of club, reading downward. Type of No. 56, with the addition of a one-handled jug in field, right. 58. Obv. Die of No. 57. Rev. АΘА to 1. of club. In 1. field above end of club, large, one-handled jug. 59. Obv. Die of No. 57. Rev. Similar to No. 58. Jug smaller in scale. 60. Obv. Die of No. 57. Rev. Similar to Nos. 58–59. 61. Obv. Die of No. 57. Rev. ΗΡАΚΛΗΙΩΝ to r. Similar to No. 57. 62. Obv. Reading of ethnic, which terminates at peak of the helmet, not certain, but apparently as on No. 60. Behind neck, K.
Rev. Die of No. 61. 63. Obv. Die of No. 62. Rev. АΘА. ΗΡАΚΛΗΙΩΝ. Same type. 64. Obv. Similar to No. 62. Rev. Similar to No. 63. 65. Obv. Die of No. 64. Rev. Similar to No. 64—differences in the details of the lion's skin. 66. Obv. Die of No. 64. Rev. Similar to No. 65. 67. Obv. Die of No. 64. 68. Obv. Die of No. 64. Rev. Similar to No. 67. 69. Obv. Die of No. 64. Rev. Similar to No. 68. 70. Obv. Similar to Nos. 64–69; the inscription smaller letters. Rev. Similar to No. 69. 71. Obv. Die of No. 70. Rev. Similar to No. 70. 72. Obv. Die of No. 70. Rev. Die of No. 66. 73. Obv. Die of No. 70. Rev. Die of Nos. 71 and 74. 74. Obv. Similar to No. 73. Rev. Die of Nos. 71 and 73. 75. Obv. Die of No. 74. Rev. Die of No. 70. 76. Obv. Die of No. 74. Rev. Similar to No. 75. 77. Obv. Die of No. 74. Rev. Similar to No. 76. 78. Obv. Die of No. 74. Rev. Similar to No. 77. 79. Obv. Similar to No. 78. Rev. Die of No. 77. 80. Obv. Similar to No. 79. Die common to Nos. 80–82. Rev. Similar to No. 79. 81. Obv. Die of No. 80. Rev. Similar to No. 80. 82. Obv. Die of No. 80. Rev. Similar to No. 81. 83. Obv. Similar to No. 82. Rev. Die of No. 82. 84. Obv. Same type. K, but ethnic lacking. Rev. Similar to No. 83. 85. Obv. ΗΡАΚΛΗΙΩΝ—the last letter below the peak of the helmet. Behind the neck, E.
Rev. Similar to No. 84. Owl in field at 1. ΑΡΙΣ parallel with club, and reading upwards. 86. Obv. Die of No. 85. Rev. Type of No. 85. 87. Obv. Die of Nos. 85–86. Rev. Type of No. 85—the owl smaller in scale. 88. Obv. Similar to No. 85. Rev. Die of No. 86. 89. Obv. Die of No. 88. Rev. Similar to No. 88. 90. Obv. Similar to No. 89. Rev. Similar to No. 88—the owl is larger. 91. Obv. Similar to No. 85. Rev. Similar to No. 89. 92. Obv. Similar to No. 91. Diagram of the relationship of obverse and reverse dies within the ninety-two varieties. Identity of obverse dies is indicated as with Nos. i and 2—for reverses, as with Nos. 17 and 18. A median period shows the absence of any known die-connections between groups. This piece was struck over an incuse coin, presumably one of Metapontum. The inscription is given in the Berlin Beschreibung as: .. PAΚΛΗΙΩΝ. The Beschreibung indicates that the fifth letter is questionable, but on 13 b the Ο is reasonably certain. The reverses of c and d show the extension of an already serious fracture. This piece is engraved on the title page of Mazochius' " In ... Tabulas Heracleenses " published in 1754. Cf. Beschreibung, p. 322. This beaded circle framing the head of Athena, although frequently off-flan or removed by cleaning, seems always to be present from this point.